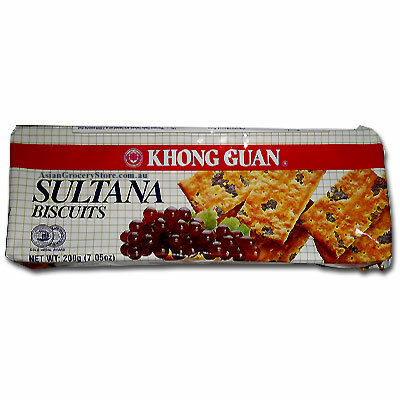 Minimum quantity for "Khong Guan Sultana Biscuits" is 1. Allergy Warning: Contains wheat flour and milk solids. This product is manufactured in a facility that also processes peanut and egg containing products. Wheat Flour,Raisins, Sugar, Vegetable Oil(palm oil), Milk Powder, Egg Powder, Salt, Leavening (ammonium bicarbonate), Artificial Food Flavour, Sodium Metabisulphite.